Falling in love is something is a magical feeling. It is followed by tons of emotions one goes through that could never entirely be explained. This is the whole point of love; from feeling butterflies to having a magical connection with the other person and being completely powerless. One thing is clear tho', its the most beautiful feeling in the world. It feels even more heavenly if the feeling is mutual. Heong Jeoung, a Korea-based artist, might give us a clue as to how magical it is to fall in love and - hopefully - live happily ever after. Painted with such gentleness and skill, those adorable fine arts will send a shiver of warm feeling every time you look at them. Art is a favorite channel to express thoughts and emotions. That's why many people in love find shelter in art because it helps them to let all their feelings out, and it helps them to share these feelings with the world. 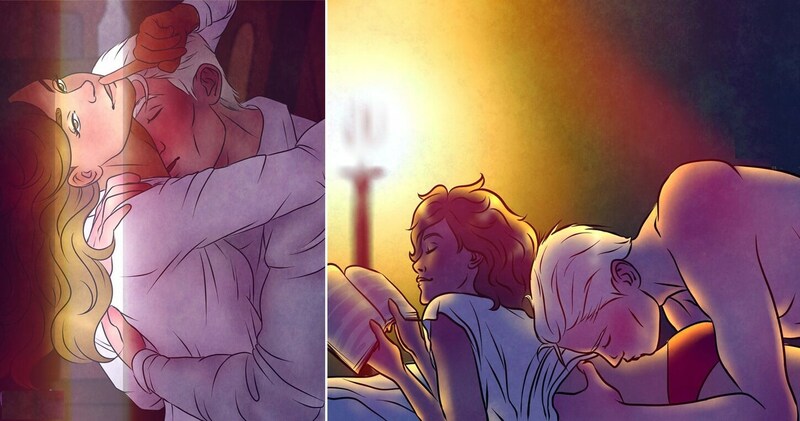 The illustrations below are both romantic and sensual, as they depict all the sweet and intimate moments between two partners who are deeply in love. Take a look for yourself and don't forget to share.